Is the Malaysian Property Market Going to Crash? What to expect in the property market in 2018 and how to profit from it? Is Property still my safety net? How to weather this storm of uncertainties. What are the signals and tell-tale signs to look out for in 2018? Doing what most property investors do today , will not cut it anymore, as the property cycle moves on, investors who embrace the changes, focus on sound investing fundamentals, and take long-term perspective to their investing will always come out ahead in the long run. Staying on top of the economic fundamentals will be essential to not only survive but prosper in today's market realities. One of the basic laws of life: There will always be opportunities for those who recognize and pursue them. The lucky people are simply those who have taken more chances than the average. When it comes to property investing you need a strategy for seizing opportunities, one that consistently demonstrates your passion for and commitment to your field. Stick with a plan, and you'll reap the rewards. 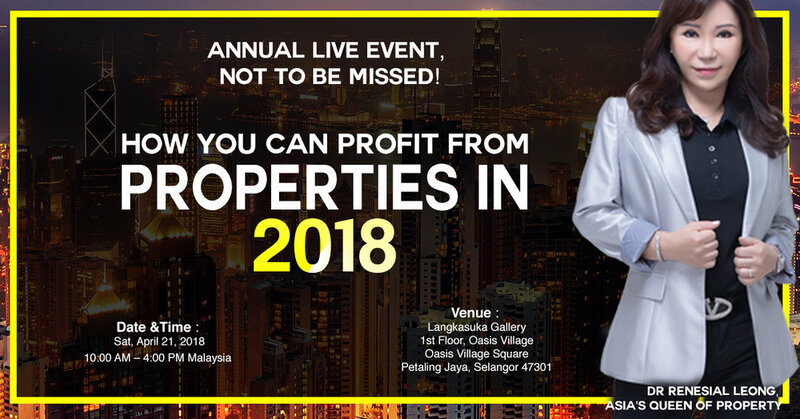 This seminar conducted by Dr Renesial Leong is for a selected group of property investor who know how to take advantage of the changes in the property market. Every time there is a change in the property cycle, FORTUNES are made, but only by KNOWLEDGEABLE property investors who can take calculated actions.